The Definitive Guide to Choosing The Office Chair For Your Needs! 1.2 Consider Your Body Shape! 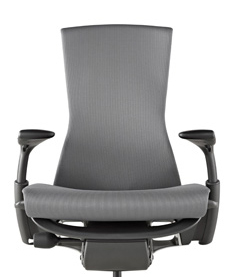 1.3 What Functionalities To Look For In An Ergonomic Office Chair? 2.2 Can A Computer Chair Help Me To Improve Ergonomics? 2.3 How Should I Sit On A Computer Chair At Work? 2.4 So What Exactly Is The Right Desk Chair Sitting Posture? 3.1 Top 9 Extremely Helpful Chair Exercises! To help you out, we have created this ultimate office chair buying guide to give you an idea what is available on the market and how they stack up against others. Just a chair, no matter how you look at it, right? Absolutely not! If you are spending most of the day anchored to a chair at a desk, then you want to find the proper desk chair that is going to be nice to your body. A chair that doesn’t conform to your body and supports certain areas such as your back and legs can actually cause long-term aches and pains, plus deteriorate your posture. It’s important to realize that not every chair is made alike, and not every of chair is going to generically accommodate every single person. Before deciding, you have to consider certain factors. Your weight and height are important ingredients when it comes to the buying a new office chair for you. Did you know chairs started to be popular only in the 16th century? For a hundred years, people used to sit on various items such as stones or benches made from different materials like wood. Chairs were a rarity and they only became very popular in the 16th century, but the oldest chair is almost 5000 years old. The Egyptians had some sort of ceremonial chairs – used only during big events and celebrations. But with the passage of time chairs have become the household furniture affordable for all and sundry – quite literally. Especially in the office workspace, chairs sit as ancient sentinels – resting the host of the employees who come and go. But as the saying goes – “too much of anything is bad” – sitting and working for hours on your office desks have triggered major concerns of health among the office-goers including back pain, joint pain, neck pain among many other issues. Instead of increasing enthusiasm among young employees to work standing up – the indispensable nature of the chairs in workspace requires a closer look at what is best seating options available in the market. Amazing ergonomic chairs can be beneficial for your body and health. It will allow you to work for longer hours without giving you major back aches, but they can be quite hefty on the pockets. If you didn’t already know, all office chairs are not created equal, just like not all individuals are created the same. 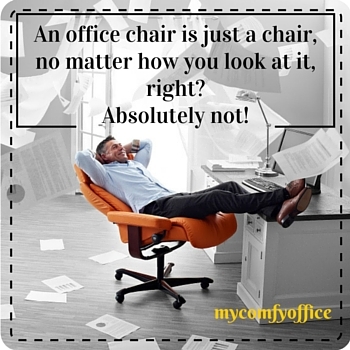 For this reason, you need to have an office chair that has the capability to adjust to individual needs. First and foremost, a good one should conform to a person’s body, which includes the back, neck, seat, and legs. A good office chair also has adjustability. It’s important that you can adjust the seat height, the tilt, and the recline of the chair. Check out the top rated reclining office chairs here! The next most important feature of a good office chair is durability. You want a chair that can withstand a person’s weight and size, which means it should be manufactured out of a sturdy material that won’t fall apart. Along with the stability, you should look for an office chair that has a 5-point base; this will avoid the possibility of tipping. Before purchasing an office chair because it’s labeled ergonomic, you first have to know that not every office chair will accommodate everyone. People are designed differently and so are chairs. It does help if an office chair has several adjustment features to assist in creating your perfect individual office chair. Height adjustments are very important when selecting an office chair and we aren’t just talking about the general height of the chair from floor to seat, we are also referring to the back height and the armrest height. All of those features need to be adjusted to fit your height. You want everything to be aligned; for instance, your knees should be aligned with your hips while sitting. Another important factor when choosing a good office chair is the tilt. Tilt tension and tilt lock allow you to find that comfortable seating position that supports your posture while sitting. Lastly, you want to find an office chair that offers adequate lumbar support. It should support the natural curve of your spine, which interprets to helping reduce the fatigue and strain that your back goes through while sitting for extended times. Overall, play with your adjustments until you find that common ground between comfort and support! Your back will thank you! If you want to learn more about buying an office chair, check out our full most comfortable office chairs buying guide. 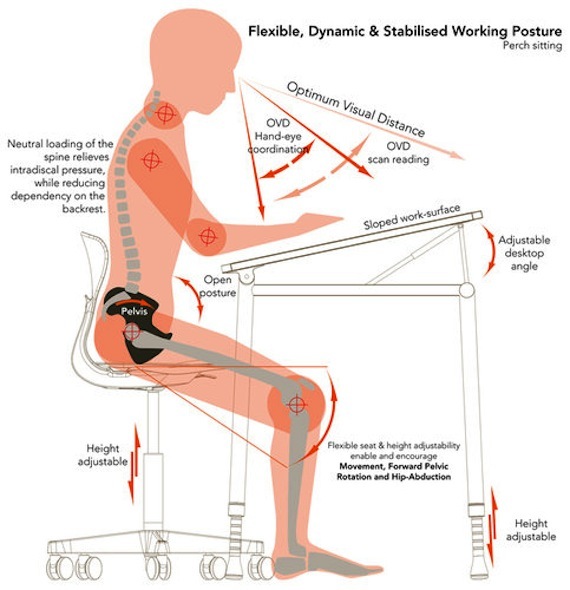 What Functionalities To Look For In An Ergonomic Office Chair? Typical office jobs are ones that require the employee to sit for lengthy periods of time, which puts strain on the body. 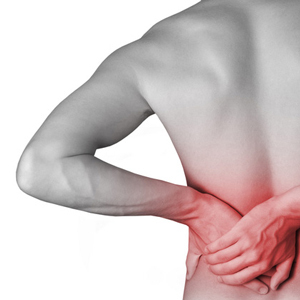 This eventually can contribute to back problems that could last you the rest of your life. A preventative measure in any position that requires sitting is ergonomic office furniture or positioning. Investing in an office chair can assist in creating a more natural environment and support for your spine. There are several office chairs out there that claim to be ergonomic and not all are what they are stacked up to be. Though you might come across a chair that you absolutely love the look of it, it’s not necessarily the ideal chair for you. When choosing the right office chair there are a few features that these chairs should have included. One of the most important features of an office chair is seat height adjustment. Pneumatic seat height adjustment is the easiest; it’s basically a lever that can be operated with one hand. It allows the chair to either be moved up or down by lifting up on a lever. The seat will go down automatically while sitting and to make the seat come up, all you have to do is shift your weight to your feet. To determine the proper height, your feet should be flat on the floor, your knees level with your hips, and your arms level to the desk or table. Another important factor of a good office chair is the seat depth and width. The seat itself should be able to accommodate any user comfortably. The depth of the chair should allow the user to sit back against the backrest while leaving a spacing distance of 2” to 4” between the knee and the chair. Keep in mind that the tilt of the seat should also be adjustable. Your spine is designed with a natural curve, similar to the shape of an S. If not properly supported it tends to lose that curve and cause slouching. It’s more difficult to reverse the slouching once you’ve been doing it for a long time and to avoid slouching, an ergonomic office chair simulates your natural curve that supports your lumbar area and promotes good posture. a backrest in an office chair should also be adjustable. We cannot emphasize it enough that no two people are designed alike and this includes your back. Some are shorter, longer, wider, etc. ; and to make sure that the lumbar portion of the backrest is matching up to your spine, the backrest should be able to lift up or tilt to fit your particular spine. It should also lock in place. I know you probably don’t consider this an ergonomic function, but the material that your chair is constructed out of is equally important as the adjustments. A good office chair should have enough padding in the seat to feel comfortable and it should also have material that breathes such as mesh. A breathable material will keep you from sweating, sticking, and feeling uncomfortable. A chair can either have or not have armrests. It depends greatly on the preference of the user or the task at hand. If you do have armrests included on the chair, you want to make sure that they are adjustable. There is nothing more annoying than an armrest that interferes with your desk. An ergonomic office chair should not be stationary; it should be able to move freely and swivel. This function helps you get to where you need to be with little or no effort. After all, if those features and functions are met then you can go for style and appeal. Determine whether or not you want armrest or not. Just because an office chair is lacking armrests, doesn’t mean that it’s not a good chair. 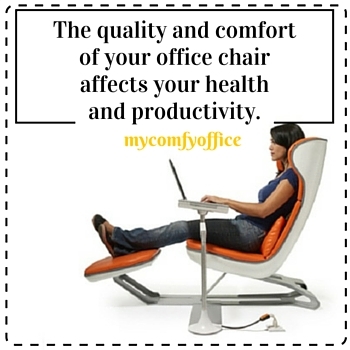 Above all, when choosing an office chair, choose something that you will be comfortable in. It seems like not so long ago an office chair was just a chair that you sit at a desk so you wouldn’t have to stand while performing your duties. They weren’t anything special, no adjustment features, and not even wheels for maneuvering around. In the olden days, if you were lucky you’d get those wheels attached to a very stiff wooden swivel chair that reclined slightly when you leaned back. Since then, studies have indicated that back pain is one of the most common work-related injuries and this also includes those who sit at a desk all day performing various tasks or working on the computer. Back pain or injury sustained while sitting in an office chair is referred to as non-accidental injury; it means the pain arose from everyday activity. If you do decide to buy an office chair, we recommend checking out our guide to top-rated office chairs for back pain. Since all this hype over back injuries, pain and other related issues caused by desk jobs have risen, somebody finally developed some smarts and decided to create ergonomics. Principals can be applied to all aspects of the job, whether sitting, standing, driving, etc. It has also been adapted into office chairs that allow for prolonged sitting at the desk or workstations. Designs of office chairs have been customized to support the back, neck, and legs, plus offer adjustments to suit each individual according to their size and stature. Carpal tunnel is another injury that can be sustained while sitting at a desk. If the height of your office chair is too high or too low, your arms and wrists tend to tweak unnaturally and eventually they will cause you pain and discomfort. It has been reported in extreme cases of carpal tunnel, surgery needed to be performed to fix the issue. Another important reason why these office chairs were created has a lot to do with insurance and workman’s compensation in the workplace. When employers figured out that if they take care of their employees by providing them better office furniture, and even techniques, they found that the insurance claims diminished. Even some employers or companies require their employees to complete training or participate in seminars so they can learn how to sit, stand, lift, or walk. By educating their employees they are reducing the chance of an injury to occur while on the job. 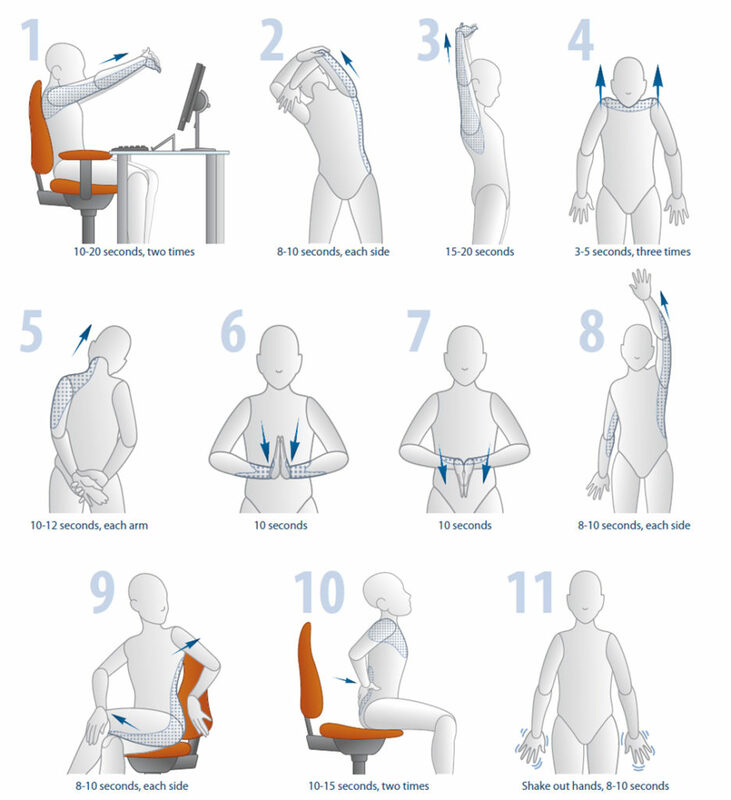 As you can see, ergonomy do play an important part in the workplace as well as your everyday life, and they should not be taken lightly, especially when it comes to your health and well-being. You are only given one body, and it’s up to you to maintain it properly. Lastly, if you feel that the equipment that has been provided to you is not meeting those needs it should be brought to your employers’ attention so they may remedy the situation. It may not seem like a big deal but, choosing the right office desk for your needs can reduce workplace injuries. If you are looking for a tall office chair & stool for your standing desk, for more details, please follow the link! It’s actually a lot more difficult to detect your own incorrect posture than it is to notice it on someone else. There are certain signs you need to look out for to keep yourself in check and avoid the slouch. Incorrect posture doesn’t just occur while sitting at your desk, it can be present while walking, carrying items, picking things up, or even talking on the phone. Here are some examples of bad posture or things that cause bad posture so that you can better identify them and attempt to avoid certain circumstances. Slouching with your shoulders hunched forward. This can happen while sitting or standing. It’s important when doing either when you sit or stand straight. Utilize the lumbar support in an office chair and don’t sit at the edge of your seat. Your shoulders should be tilted back slightly and your head looking straight ahead; not at the ground and not cocked sideways. Over exaggerating the natural curve of your back, which is also known as swayback or Lordosis. You want to maintain the natural curve as much as possible. Don’t carry anything that is too heavy on one side of your body; if at all possible seek assistance with anything that is of an uncomfortable weight. If you have ever seen a mother carry her child on hip, you’d notice that she overcompensates that burden buy leaning, therefore putting additional strain on the spine. Holding a phone between your neck and shoulder. It may seem like the simplest of tasks, but it can cause unnecessary discomfort if you make a habit out of it. Sleeping on a mattress or pillow that does not offer the proper support. These are all small examples of everyday scenarios that can lead to bad posture. Try identifying these habits in your life. Take a moment every hour to check yourself. It’s also a good idea to use a buddy system. Have your buddy or co-workers bring bad posture scenarios to your attention. Like we said, it’s not always easy to watch your own posture as it is to watch someone else’s. We feel that by providing you with adequate and honest information on what is available it will help you make a decision that is right for you and your needs. Were you able to get a feel of what ergonomics, good posture and a good office chair have in common? If you did, then we have accomplished what we set out to do and that is helping consumers like you. Our site provides everything you need to know all about ergonomic chairs. So you don’t have to waste your time searching for different products all over the internet. Finding the right office chair is so important, and that is why we give these reviews. Can A Computer Chair Help Me To Improve Ergonomics? To answer this question in the most simplistic way possible, yes, it can. Not having an ergonomic computer chair, especially when sitting for extended periods of time can cause more damage to your back, and cause unnecessary discomfort in neck, shoulders, legs, and of course your back. If you’re considering the fact that you work at a desk or a computer for eight or more hours a day, your body is being subjected to an unnatural position especially if you slouch. An ergonomic office chair basically forces your body to retain a good seating position, assisting with the natural S-shape curve of your spine, and keeping everything balanced and aligned. Another thing you should keep in mind is an office chair isn’t the only ergonomic office feature available. 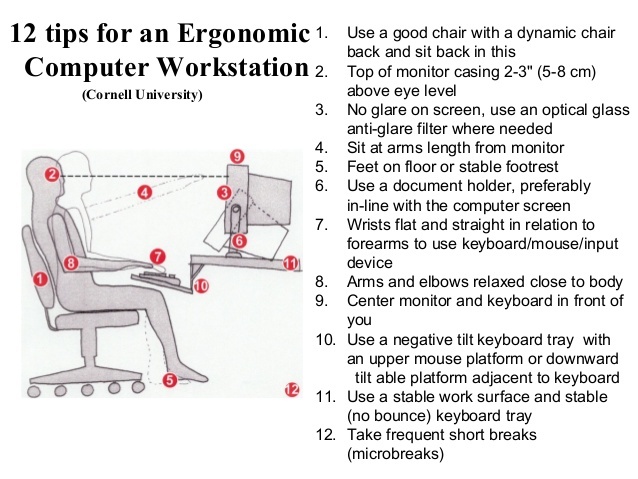 Ergonomics are also incorporated in desks, filing cabinets, phones etc. All of those items combined will help you, but you still have to play a part in the health of your body which includes sitting straight, exercise, and stretch. Remain vigilant when sitting and aware of your surroundings and how your body is reacting to certain situations. Pain is an indication that something isn’t quite right, so pay attention and adjust accordingly. Then why not check out tips for improving posture and ergonomics! How Should I Sit On A Computer Chair At Work? You’re always going to experience some stiffness in your body if sitting for prolonged periods while performing everyday office duties such as filing, working on the computer, or other tasks as assigned. Even the desk chairs require you to be vigilant when taking care of your body. Though they help immensely if you position them to your proportions correctly, there are other ways that can help reduce back pain. As you sit, your body becomes stagnant, creating a strain on your neck, shoulders, back and legs. Plus, if you already have an existing injury, it can further create havoc. It’s extremely important to make time in your day to alter your position, such as standing, stretching, or just taking a break from the chair such as getting up for 5 minutes every 30 to 40 minutes. Find ways to stand at your desk while performing your duties. This can easily be done while talking on the phone or filing papers in a filing cabinet. Certain exercises can also be included in your day while sitting. Here are some examples that will assist you. It might seem somewhat awkward at first, but you’re doing yourself a favor, especially when you’re already subjecting yourself to one of the worst positions for your body, which is sitting. So What Exactly Is The Right Desk Chair Sitting Posture? Let’s dive into more information about proper posture and place it in everyday life which are the things you do normally as a routine. While you’re driving, standing, sitting at a desk chair, or walking has it ever crossed your mind that you should pay attention to your body and the way you are positioning yourself during these routine tasks? Probably not, but putting a conscious effort and posture while performing these tasks can reduce the strain on your body. And it assists in reducing the possibility of pain from these activities. We want to emphasize the importance of maintaining a good natural posture when sitting in your office chair. Generally, office positions require you to sit at a desk for sometimes 8 hours a day and when you’re involved in a project or a deadline, stretching and exercising is the last thing on your mind. However, you should always attempt to keep your posture as straight and normal as possible. If this is the first time you have thought about your posture, it’s probably going to feel a little weird at first. That’s because your body has been trained to slouch and learn. Retraining might take some effort on your part, but it will become easier and more natural the longer you do it. To obtain a proper friendly workstation you’ll have to make some adjustments which include computer office chair, and desk positioning. Your office chair should be the appropriate height so that your feet are flat on the floor without dangling. Your knees should be level with your hips, and your torso should be vertical with the natural curvature present in your lower back. Then when you have that all together, practice your sitting. Many people sit at the front of their chair which causes them to hunch forward. Instead, sit all the way back in the chair and let the lumbar support work its magic. It provides that extra support you need for the natural curvature of your spine and will assist you in sitting erect without slouching. Again, and we can’t emphasize this enough…Take breaks! How Do You Adjust a Desk Chair for Your Height? Adjusting a desk chair to match your height is extremely important. An ergonomic desk chair helps you maintain an appropriate balance while keeping your posture straight and eliminating fatigue on your lower back and legs. To adjust a seat height properly, you first you need to stand behind the chair; the seat of the office chair should rest just below your knees. Once that is done, sit in the chair and keep your feet flat on the floor. Next, check the clearance between your calves and the front portion of the chair. There should be about a 2” clearance or about the size of a fist. 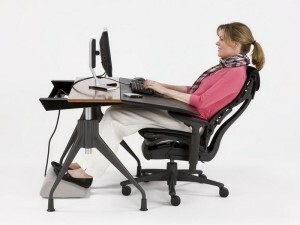 In addition, you also want to make sure that your legs can easily slide under your desk without catching. If you need to make adjustments to the distance between your calves and the seat or the height you can also adjust the tilt function. Never wrap your feet around the castors, or use them as your main footrest as it creates strain to your legs and back. Having your feet placed flatly on the floor in front of you keeps your body in the position it should be for better posture and long-lasting comfort. It’s not a big issue, really. The controversy came from thinking that having armrests would prevent the office chair from getting close enough to the desk, and yes, that could be an issue when it comes to proper posture or productivity. However, by decreasing the length of the armrests to about 10 inches or less from the back of the seat would work just fine, or how the theorists described it as, appropriate. Now, it is also said that armrests are beneficial to the user as they take some of the load off of the shoulders, and one can comfortably type or perform whatever duties they need to at their workstation without causing unnecessary strain. Another important factor when considering to have armrests or not is the task at hand. You need to think whether or not the armrests would interfere with your job or get in the way of your work area. Certain types of armrests can assist with and help support during various precision tasks, while armrests can hinder others. To us, it’s just an individual preference. If you choose an office chair where the armrest doesn’t interfere with your work area or doesn’t prevent you from pushing your chair in enough so you don’t slouch, we see nothing wrong with them. The main importance of office chairs is to alleviate pressure, fatigue while maintaining good posture when your job requires you to sit for lengthy periods of time. If you are doing all that, then you have a nice office chair. Also, when selecting an office chair with armrests, one should consider getting a chair that allows you to adjust the armrests to various heights and lengths to accommodate you. Your spine will thank you later. Let us tell you what good posture can do for you in the short and long term. Keeps your joints and bones in proper alignment so that your muscles are being used correctly. It prevents arthritis by decreasing the abnormal wearing of the joints. Just think of all the great benefits you can achieve by practicing good posture in your work environment. Not to mention the decrease in medical bills that you might have to fork out if you choose not to pay attention to the way you sit, stand, or perform tasks. Top 9 Extremely Helpful Chair Exercises! Stand up and sit down with no hands – This might not be what you would generally consider an exercise, but doing this is quite the challenge. It’s not only good for your back, but it also strengthens the muscles in your legs and abdomen. Shrug and roll your shoulders – this small exercise releases tension in the shoulder and neck area. Lift your arms over your head and grab onto the opposite arm at the elbow and pull behind your head, repeat on the other side. Stretch out your arms pointing them to the floor and extend your fingertips. It’s a simple stretching exercise that will increase your circulation, plus it feels good. Do leg extensions – stretch your legs out in front of you while holding the bottom of your seat, then flex and point your toes at least five times. Repeat 3 times. Give yourself a hug – wrap your arms around your torso with your hands placed on your shoulders, and then breathe in and out. This can release the tension between your shoulder blades. Give your legs a hug – place your feet flat on the floor together, lean forward and grasp the opposite arm behind the leg. Hold that position for 5 to 10 seconds. Repeat 3 times. And Please! Don’t eat at your desk! This is your break time and you should take advantage of the time and eat your lunch while taking a walk with your colleagues or friends. Bonus! Some people don’t really like to read. Here is the step by step demonstration! In addition to stretching and exercising it does help to have one of these chairs available. They allow you to make those certain adjustments that assist in taking care of your back, legs, and neck. That is why it’s so very important that you research the top office chairs to know what they do and don’t have when it comes to features. Office chairs are the key to good posture and avoiding the pain. As mentioned before in a separate section, lumbar support, height, and other features that allow for natural movement plus help to maintain proper posture are desired when seeking out your perfect office chair. Just because a chair looks good doesn’t mean that it is good for you, and even the best looking, most expensive chairs can cause damage to your spine. To determine what a correct sitting position for good posture should be, sit at the end of your chair and slouch, then pull yourself up, sitting straight, but accentuating the natural curve in your lower lumbar area and hold for a few seconds. Relax just slightly about 10°, this should be the ideal sitting posture. Remember pain is an indicator that something isn’t right, pay attention to those signals and adjust accordingly. As we wrap this portion up we hope that we have provided you with the most valuable information on office chairs your body will love and also, how to keep your body in good working alignment to prevent unnecessary pain and discomfort from sitting. Remember, it’s important to research the possibilities so you aren’t stuck with an uncomfortable desk chair for hours a day. We also strive to give you the reviews on the latest out there to assist in deciding what is going to be right for you and your needs. Take care of your body because it’s designed to take care of you.